Russian physician and cabalist; born at the beginning of the eighteenth century. 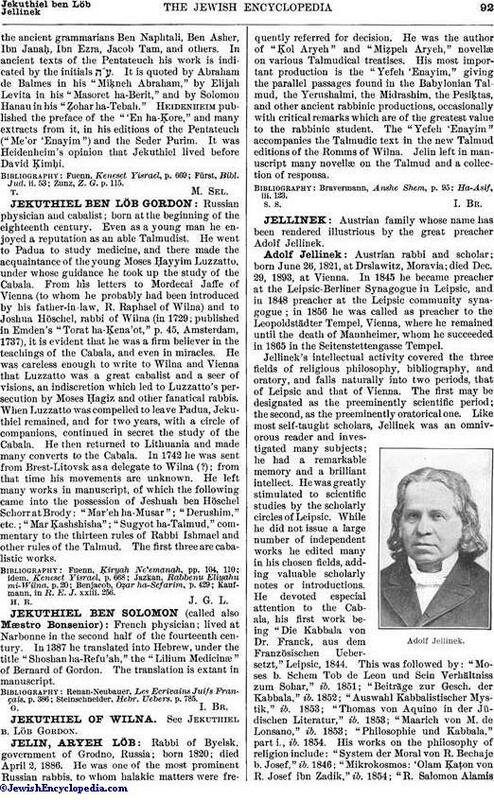 Even as a young man he enjoyed a reputation as an able Talmudist. He went to Padua to study medicine, and there made the acquaintance of the young Moses Ḥayyim Luzzatto, under whose guidance he took up the study of the Cabala. From his letters to Mordecai Jaffe of Vienna (to whom he probably had been introduced by his father-in-law, R. Raphael of Wilna) and to Joshua Höschel, rabbi of Wilna (in 1729; published in Emden's "Torat ha-Ḳena'ot," p. 45, Amsterdam, 1737), it is evident that he was a firm believer in the teachings of the Cabala, and even in miracles. He was careless enough to write to Wilna and Vienna that Luzzatto was a great cabalist and a seer of visions, an indiscretion which led to Luzzatto's persecution by Moses Ḥagiz and other fanatical rabbis. When Luzzatto was compelled to leave Padua, Jekuthiel remained, and for two years, with a circle of companions, continued in secret the study of the Cabala. He then returned to Lithuania and made many converts to the Cabala. In 1742 he was sent from Brest-Litovsk as a delegate to Wilna (? ); from that time his movements are unknown. He left many works in manuscript, of which the following came into the possession of Jeshuah ben Höschel Schorr at Brody: "Mar'eh ha-Musar"; "Derushim," etc. ; "Mar Ḳashshisha"; "Sugyot ha-Talmud," commentary to the thirteen rules of Rabbi Ishmael and other rules of the Talmud. The first three are cabalistic works. Kaufmann, in R. E. J. xxiii. 256.